How do you pick which wine to serve at an event? Picking wine for an event can feel like a big job – with so many beautiful varieties, how can you choose a crowd pleaser? Generally speaking, it’s a good idea to pick at least one red wine and one white wine. Although popular choices such as Chardonnays and Merlots are people-pleasers, they’re not always the best option for big events, as they can overwhelm any hors d’oeuvres you serve and can be tricky to pair with lighter dishes. Instead, go for a wine that can served with all kinds of food, such as a Sauvignon Blanc and a Pinot Noir. Which wines should be served first? If your event involves food, you’ll certainly need to set some time aside to plan what wine you’d like to serve, and at which point. It’s a good idea to select your wine the same time you select your menu choices to ensure that it enhances the flavours of the meal, and vice versa. Your caterer should provide you with some valuable food and wine matching advice to help you get it just right. • Avoid serving a powerful wine such as a Bordeaux before moving onto a lighter wine such as a Pinot Noir. You should go from light to full-bodied, as otherwise the tannins will stick to your palate and neutralise the more subtle aromas from the second wine. This is the case with white wines, too! • There’s an exception to this rule when it comes to Champagne, which is always a hit and can be served before, during, or after a meal. • As light-bodied wines should be served first, whites and rosés should come out before the reds, as the aromas of the fresher flavours need a clear palate to be tasted and enjoyed as they should be. • Serve younger wines before serving aged wines later in the evening. This is simply because the beautiful aromas and flavours of older wines may be hard to live up to after they have been sipped! How much wine will you need to serve at your event? A good rule of thumb to make sure you have enough wine to last a meal is to assume that each guest will drink between half and three-quarters of a bottle each. If wine is also being served with the cocktails before dinner, then double that amount. It’s also important to remember that people tend to drink a smaller amount of red wine than they do white, so consider stocking up with a few more cases of white. 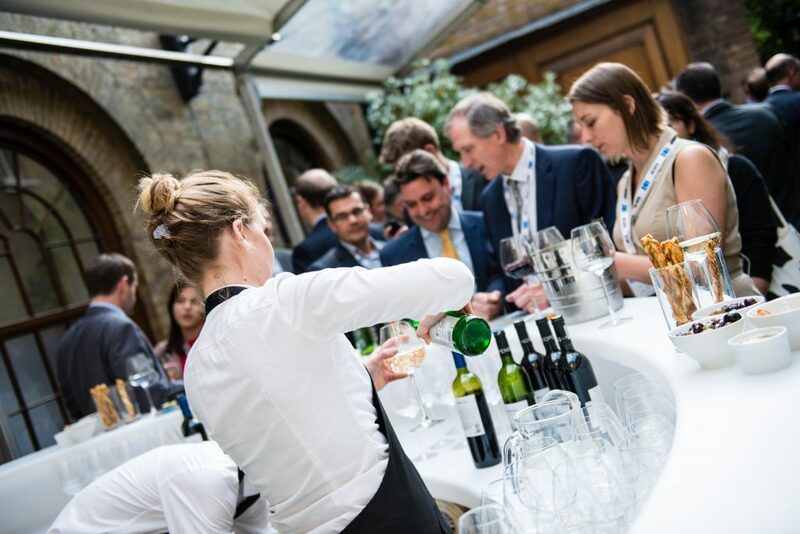 How should you serve wine at an event? • Serve big reds such as Cabernet Sauvignon and Bordeaux at 18° to 20°C, medium-bodied reds such as Merlot and Pinot Noir at 15.5° to 18°C and light-bodied reds such as Bardolino at 13°C. When it comes to whites, pretty much all of them, including Chardonnay, Chablis and Pinot Grigio, should be served at 7° to 10°C. Sparkling wines and rosés are best enjoyed nice and cold, at around 4°C. • Wine should be poured into a glass that is no more than two-thirds full. This allows room for the wine to be swirled, and the aromas to be collected in the top half of the glass, which makes for an entirely different wine-drinking experience! • There’s nothing worse that having to wait at the bar to be served, especially if it means your guests may miss out on parts of the event. Make sure you have at least two bartenders for every 100 guests. Here at The Brewery, we understand the significance of excellent wine at an event. That’s why our sales team are trained with the Wine and Spirit Education Trust to ensure they’re equipped with everything they need to know about serving and selecting the best wines, cocktails and beers at your event. All of the wine served at The Brewery has been hand-picked from suppliers of different sizes, whether large or small boutique growers, from all over the world. Not only that, we also travel back to the source to take a look at how the wine is produced, and to be sure that only the best wine is selected for our customers. 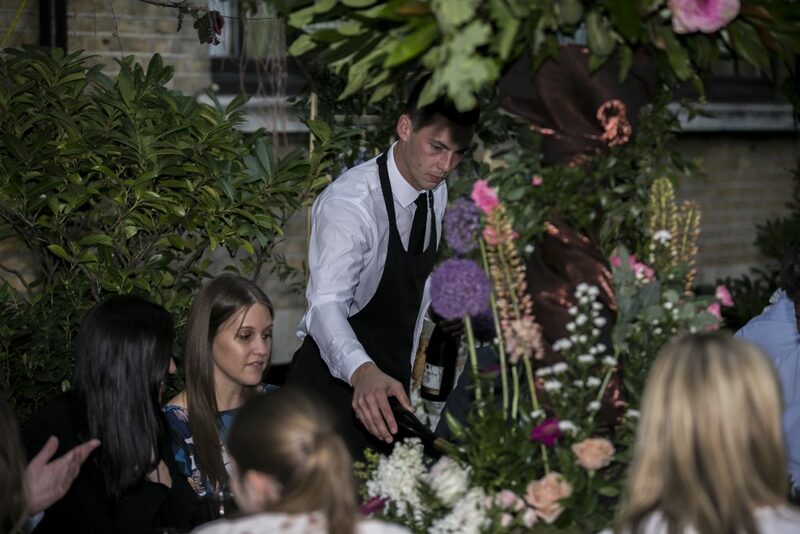 If you’re planning an event, contact us to find out how we can impress your guests with menus from our award-winning chefs, and our selection of delicious global wines to match.